Crayons have come a long way since you and I were kids. Modern day variations think outside the box and color outside of the design lines of their classic counterparts. Pete Goldlust carved the crayons shown above into exquisite works of art unto themselves, demonstrating that the medium may be as revered as the finished masterpiece. Crayons have also evolved past their standard stick form, and now tots can more easily grasp and wield the colorful tools in the shapes of crayon stones, crayon rockets, and crayon rocks! Art supply designers Wee Can Too makes edible veggie crayons that are actually safe to eat since they’re made with entirely edible ingredients like organic fruit and vegetable powders — in the event your curious tot takes a bite. Luxirare also cooks up crayons a la carte using marshmallows, nuts, sesame seeds and additional colorful ingredients used to achieve certain hues. These recycled cupcake shaped crayons come in the shape of the beloved dessert, and while they make vibrant eye-candy, they are not to eat and should only be used for their intended purpose. With Valentine’s Day around the corner, crayons lovers will certainly light-up at these super cute recycled conversation heart crayons. It’s easy to find eco-friendly crayons that are nontoxic and responsibly made. Here are 7 of our favorite green crayon options for budding artists. And these handmade wooden crayon holders offer a cute way to contain crayons while keeping art supplies organized and within reach. Crayons have come a long way since you and I were kids. Modern day variations think outside the box and color outside of the design lines of their classic counterparts. Pete Goldlust carved the crayons shown above into exquisite works of art unto themselves, demonstrating that the medium may be as revered as the finished masterpiece. 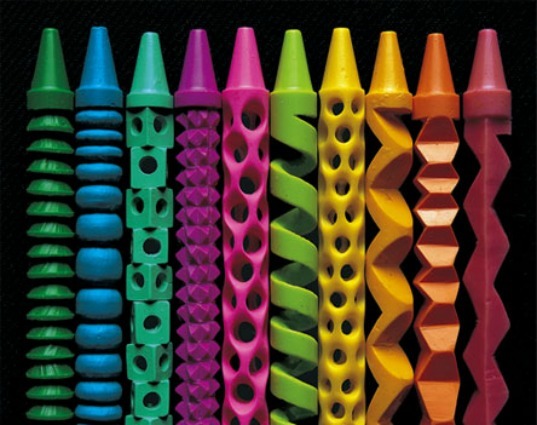 Crayons have also evolved past their standard stick form, and now tots can more easily grasp and wield the colorful tools in the shapes of crayon stones, crayon rockets, and crayon rocks! Art supply designers Wee Can Too makes edible veggie crayons that are actually safe to eat since they're�made with entirely edible ingredients like organic fruit and vegetable powders -- in the event your curious tot takes a bite. Luxirare also cooks up crayons a la carte using marshmallows, nuts, sesame seeds and additional colorful ingredients used to achieve certain hues. These recycled cupcake shaped crayons come in the shape of the beloved dessert, and while they make vibrant eye-candy, they are not to eat and should only be used for their intended purpose. With Valentine's Day around the corner, crayons lovers will certainly light-up at these super cute recycled conversation heart crayons. It's easy to find eco-friendly crayons that are nontoxic and responsibly made. Here are 7 of our favorite green crayon options for budding artists. And these handmade wooden crayon holders offer a cute way to contain crayons while keeping art supplies organized and within reach.